After many years of using Using OpenLDAP for User Authentication, and Using Kerberos 5 for Single Sign-On Authentication, it was time to look at FreeIPA as a way of streamlining everything. Important Note: You will want to have FreeIPA on it's own system (whether this is a virtual machine using something like KVM, or dedicated hardware). Making FreeIPA try to place nice with existing services (like Apache, etc) will lead to copious amounts of frustration! This will result in quite a lot of packages being installed, if you did not elect to install the IPA server during the initial system install. The next step is to start the server configuration process. The ipa-server-install program is used to set everything up. It's interactive, but essentially it configures a stand-alone CA (dogtag) for certificate management, configures ntpd which is important for Kerberos, configures the directory server (which uses the 389 Directory Server rather than OpenLDAP), configures the KDC, and also configures Apache. And that's all there is to setting it up. Next, there are a few things to clean-up. If you're not running BIND already, it's sufficient to use this file alone. If you already have a BIND server setup, you will need to include these LDAP/Kerberos/NTP-related lines in your existing zone file. Essentially, these are the records that define the services provided by the IPA server so that they can be found via DNS. All the service (SRV) records include the service name (_kerberos) and protocol (tcp) as well as the port (so port 389 for LDAP, 88 for Kerberos, etc.) and then the host that answers (ipa, in this case). BIND must be restarted after either adding this temporary file, or cutting-and-pasting the relevant parts to your own configuration file. If you get output similar to the above, the Kerberos aspect of IPA is working properly. Note that the password you provided during the install for the IPA administrator is the password you would use here. Also note that when you are making any changes to IPA (via the ipa commandline tool), you must have a valid Kerberos ticket. Once you have made the changes, remember to issue service iptables restart. The next step would be to add users to IPA. This allows you to authenticate against the IPA system -- without a user account, you can't login to a system that uses IPA for authentication. The ipa tool provides a lot of functionality, one of which is to add users. Because I'm replacing an OpenLDAP directory, I've already got some defaults that are in use on my systems, so I want to be able to specify the shell and a specific UID/GID. ipa lets me do so. Try `ipa --help` for a list of global options. IPA clients are added to the directory by enrolling them. Operating systems that do not have the ipa-client-install program (like OS X), will need to follow the steps in the #Configuring IPA Clients section to enroll properly. The enrolment only adds hosts, and thus only generates the keytab for the host, which is fine for things like SSH. However, if you want to use mod_auth_kerb or something similar for Kerberos-authenticated HTTP/HTTPS, you will need to add a service. The web UI for IPA 2.2.x is not very good for adding services, so it's off to the command-line again. Now you are authenticated to IPA as the admin Kerberos principal and can use the ipa program to configure things. The hostname in question must already be enrolled with IPA, so you will need to use the server's fully qualified domain name. Once the service is created and the keytab exported, copy the file to the server in question. This will work for other services as well: LDAP, NFS, etc. As an aside, there is a fantastic write-up on how to use MediaWiki with FreeIPA: Setting up MediaWiki to run against FreeIPA. I highly recommend this, even if it's not for setting up a MediaWiki instance (the nice thing with MediaWiki is you can make it use your kerberos credentials). It also details how to create an SSL certificate for a web service, which you can use the IPA CA (DogTag) to manage. By default, the instructions use mod_nss versus mod_ssl, which was a little strange as I've never used mod_nss before, but it seems to work quite well. How you configure the IPA clients depends on the client operating system. These instructions work for Red Hat Enterprise Linux 5, 6, and 7 (and the equivalent versions of CentOS). You can verify the enrolment in the IPA web UI, under Identity, then Hosts. You should see the newly enrolled server here, and if you click on it you should see things like the MAC address, the SSH pubkeys of the server, and whether or not it was setup with a kerberos host. Unlike with Fedora or Red Hat Enterprise Linux (and variants), there is no ipa-client-install tool written for OS X, so the process is quite manual and very similar to that outlined in Using Kerberos for Single Sign-On Authentication, except that we will attempt to configure OS X to handle everything that a Linux client would, not just Kerberos. This will allow you to kinit on the system and access kerberized services. By adding "default_principal" and calling pam_krb5.so twice you ensure that you get a Kerberos ticket when you log in. Otherwise the system will authenticate against Kerberos with your password, but will not obtain a ticket. NOTE: there is one really annoying caveat here, as noted in IOWA State University's Kerberized Login document (or the bug report in particular). If you call kinit from the commandline, the login window will not grant a new ticket on subsequent logins. If you never call kinit from the commandline, then the login window will always obtain the ticket for you. If you do happen to call kinit on the commandline, make sure you also call kdestroy before you log out. Firefox can be configured the same on OS X as it is on other platforms, see Configuring Firefox to use Kerberos for details. Because we cannot enroll the system into IPA the easy way, we need to visit the web UI and add a new host. In the IPA web UI, go the Identity and then the Hosts page. Click the "Add" button, where you will need to add the fully qualified domain name of the host (e.g. 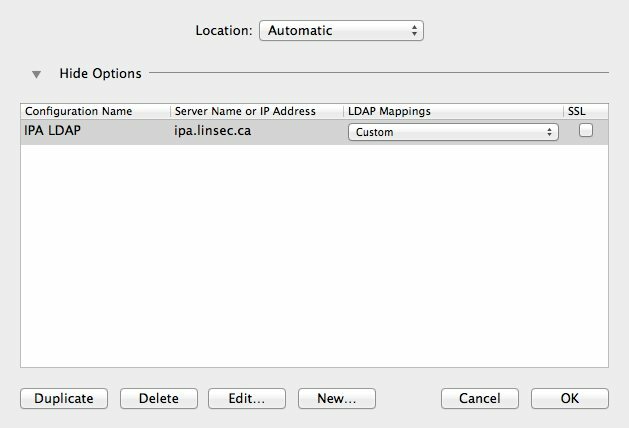 mac.linsec.ca), and then click the "Add and Edit" button. You don't need to add much here, other than the MAC address of the system, and the SSH public keys, which can be found in /etc/ssh_host_dsa_key.pub and /etc/ssh_host_rsa_key.pub. The Ethernet MAC address can be found via either ifconfig or System Preferences. The key here is we want to use host/[FQDN] as the kerberos principal. Incidentally, you can add the host from the command line using ipa host-add as well, but with the web UI you can cut and paste the SSH pubkeys. Now that the keytab is generated, just copy it from the server to the new workstation and place it in /etc/krb5.keytab. Make sure the file is owned by the user root and group wheel (root:wheel) and is mode 0600. This one is a bit of a bear to get right. The FreeIPA documentation on OS X Client Configuration is out-dated (written for OS X 10.4), and the Fedora documentation has absolutely nothing about OS X clients. 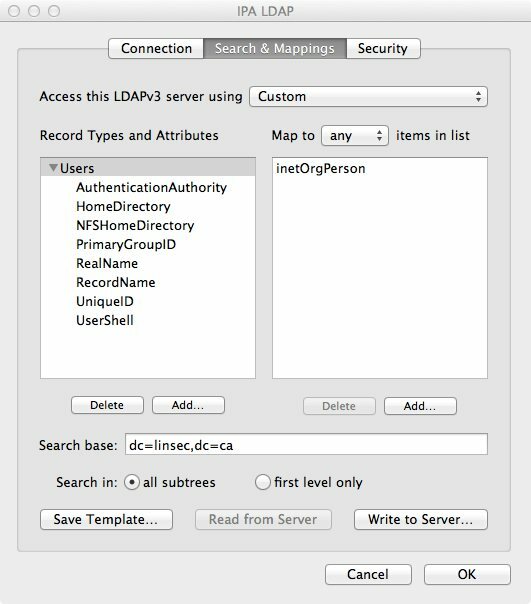 As we've already seen, setting up OS X is a pretty manual affair and getting the LDAP lookups to work correctly is no different. To begin, launch Directory Utility. On the Services pane will be three service names: Active Directory, LDAPv3, and NIS. After authenticating (click the padlock), click the "LDAPv3" line to highlight it, then click the little pencil icon to edit. Click the "New..." button and enter the IPA server name in the "Server Name or IP Address" field. Make sure that "Encrypt using SSL" is unchecked, as well as the "Use for contacts" (you could, optionally, use the LDAP directory for contact information but the point of this particular exercise is for authentication, so at this point turn it off). You should be back at the option list. 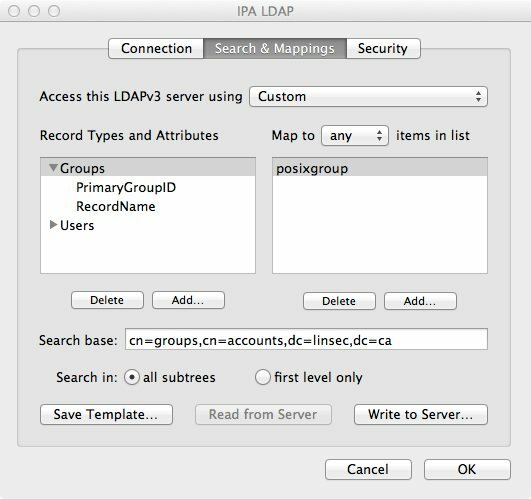 Enter "IPA LDAP" for the configuration name, and select "Custom" for the LDAP Mappings. Make sure the SSL checkbox is not checked. Now highlight the new entry and click the "Edit..." button. Unfortunately, at least in OS X 10.8, you cannot change the re-bind attempts timeout from the default of 120 seconds; you can change it in OS X 10.7, so if using that version set it to 10s as well. Also ensure that SSL encryption and the custom port are unchecked. Under the "Search & Mappings" tab, you will need to add a few record types and attributes. In the first pane, click the "Add..." button and add the Record Type of "Users". This should show up in the first pane, so in the second pane click the "Add..." button and you'll have an entry field. Type in inetOrgPerson here and press enter or click outside of the edit box. Now you should be able to define the Search base near the bottom of the window; set it to dc=linsec,dc=ca or whatever the search base might be (e.g. dc=example,dc=com, etc.) and make sure the "all subtrees" radio button is selected. For the above you, you have a choice for the HomeDirectory and NFSHomeDirectory options. If you use homeDirectory for both, it will map to /home/[user] which is fine for automounted home directories (/home/ is an automount on OS X). However, if you want a local directory on the machine for the user (not an automounted/shared home directory), use #/Users/$uid$ instead. Once this is done, click the "OK" button to save and return to the server list. Click "OK" again and head to the Search Policy pane. In the "Authentication" page, click the "+" button and add your new LDAP server definition (e.g. "/LDAPv3/ipa.linsec.ca"). It will show up after the "/Local/Default" domain. Make sure that the "Search" field is set to "Custom path". Now move to the Directory Editor pane. 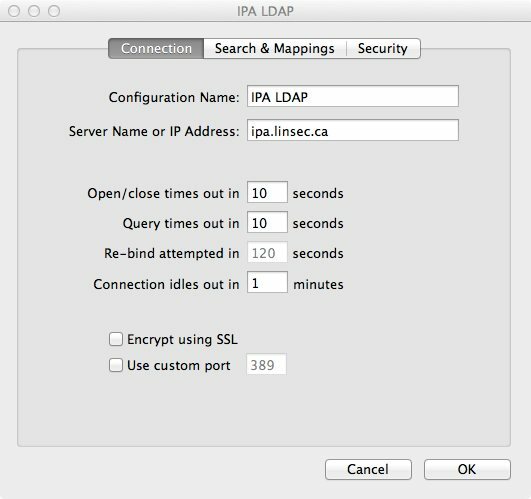 If everything is setup correctly, you should see a list of users pulled from the IPA server's LDAP directory on the right. If you click one of the user names, you should see a pane full of name and value pairs, which is what OS X is mapping locally from the directory server. The items in grey are the static bits that OS X generates, and the names starting with "dsAttrTypeNative:" are the un-mapped bits from the LDAP directory. You should see quite a few of them, including kerberos principal name, password policy references, the "dsAttrTypeNative:ipaUniqueID", and so on. More importantly, you should see at the top various bits that are being mapped properly. As with the Users record type, you will need to set the search base for groups. Click the "Groups" record type and use cn=groups,cn=accounts,dc=linsec,dc=ca for the search base. Click "OK" to save. You can now go to the "Directory Editor" and select "Groups" from the "Viewing" pulldown menu and you should see all of the groups from your directory, just as you did for the users. Should also see a lot of information in the Name/Value screen showing that the groups were properly found. The default group for local OS X users is staff which is not used with IPA. So for remote users, you will want to use the user's group and private group as defined in IPA (usually the same name, like vdanen:vdanen). So home directories, when created, will propagate group ownership; if you create the home directory as [user]:staff then all files beneath it will be owned [user]:staff; if you create it [user]:[group], then all files beneath the home directory will be created with the same ownership. So, when creating the home directory use chown vdanen:vdanen (or [user]:[group]) and then all files created beneath the directory will have the correct ownership. Allow network users to log in at login window (checked, you can restrict to certain users by clicking "Options..."
The klist output should show both host and nfs entries for the system. Next, create the service entry and obtain a service ticket. For this example, we're going to assume that the server is also nfs.linsec.ca, so this will be providing both NFSv4 and AFP services. This tells afpd to use TCP-only, to use GSSAPI for authentication, provides the kerberos service name (afpserver), the kerberos realm (LINSEC.CA), the location of the keytab, and the fully qualified domain name of the server, and the port that afpd is listening to. Configure your /etc/netatalk/AppleVolumes.default to suit and (re)start the netatalk service. These can be set in the about:config settings of the browser. do shell script "open -n -a 'Google Chrome.app' --args --auth-server-whitelist='*.linsec.ca' --auth-negotiate-delegate-whitelist='*.linsec.ca'; echo"
$ defaults write com.google.Chrome AuthServerWhitelist "*.linsec.ca"
$ defaults write com.google.Chrome AuthNegotiateDelegateWhitelist "*.linsec.ca"
If you are using the Chromium browser, you would use org.chromium.Chromium instead. To see whether or not the configuration worked, you can look at the about:policy page in the web browser. At this time, at least with Safari 6.0.4, it does not look like it supports delegation. So while Safari may work transparently with some kerberos-authenticated sites, for any sites that require delegation, Safari will not work (this includes the IPA web interface). Safari does work, when the host operating system is properly configured, with web interfaces that do not require delegation (for instance, it may work with a site using Apache's mod_auth_kerb (such as MediaWiki), but will not with IPA).